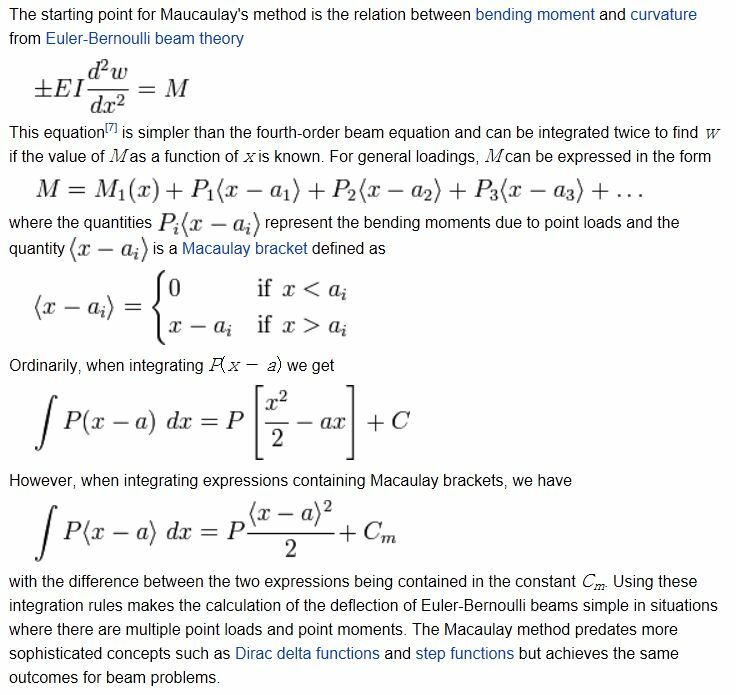 Macaulay’s Method is a convenient method of applying beam slope-deflection equations to find the shear forces, bending moments, slopes and deflections of a structural beam subject to complex load conditions, including partial varying distributed loads and point loads and moments. It is described in Wikipedia, and in more detail, with numerous examples by Colin Caprani. 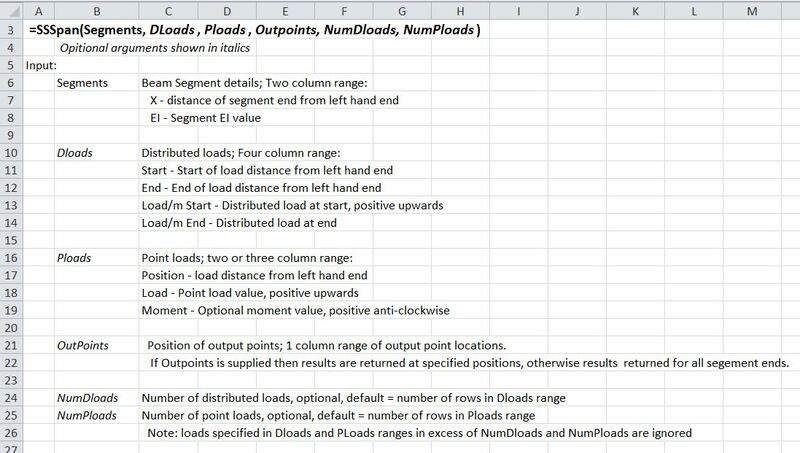 I have developed a spreadsheet using this method to analyse simply supported beams, continuous beams, and to find fixed end moments. The spreadsheet, including full open source code, may be downloaded from Macaulay.zip. 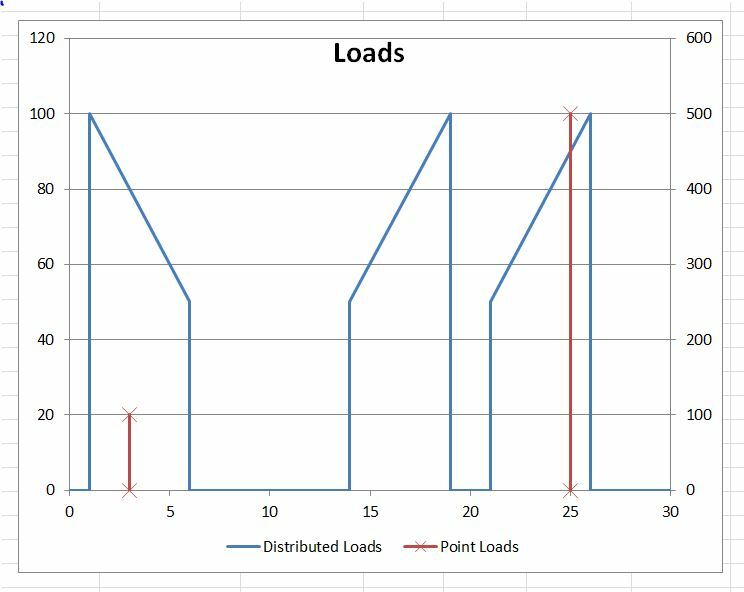 This post describes the background, and the User Defined Functions (UDFs) for analysis of simply supported beams. Later posts will look at the extension of the method to fixed end actions, continuous beams, spring supports, shear deflections etc. Solve for shear forces, bending moments, curvatures, slopes and deflections, assuming zero rotation at the left hand end; adjusting for variations in the section stiffness if required. Rotate for zero deflection at the right hand end.. Note that columns 4 and 5 are initially determined with a unit EI value, then corrected for the specified EI. This procedure is required to handle beams with varying flexural stiffness along their length. 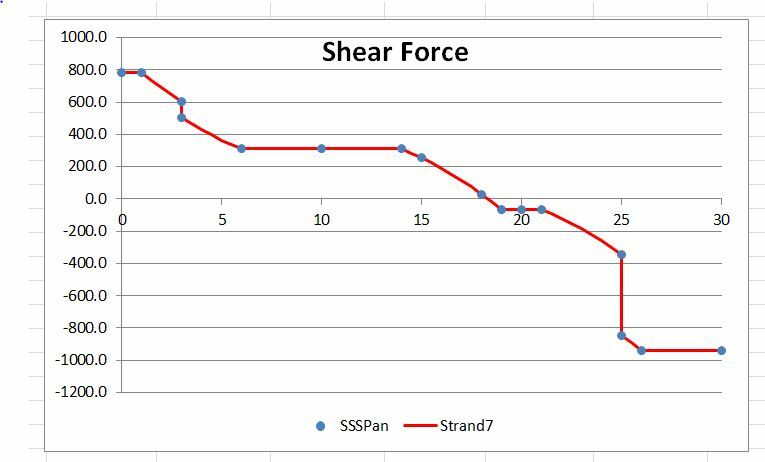 The array SSRes at this stage has correct values for shear and bending moment, but the slopes and deflections are based on zero slope at the left hand end. This is corrected by finding the slope required to make the deflection at the right hand end equal to zero, then adding this slope and the associated deflection to the output values. 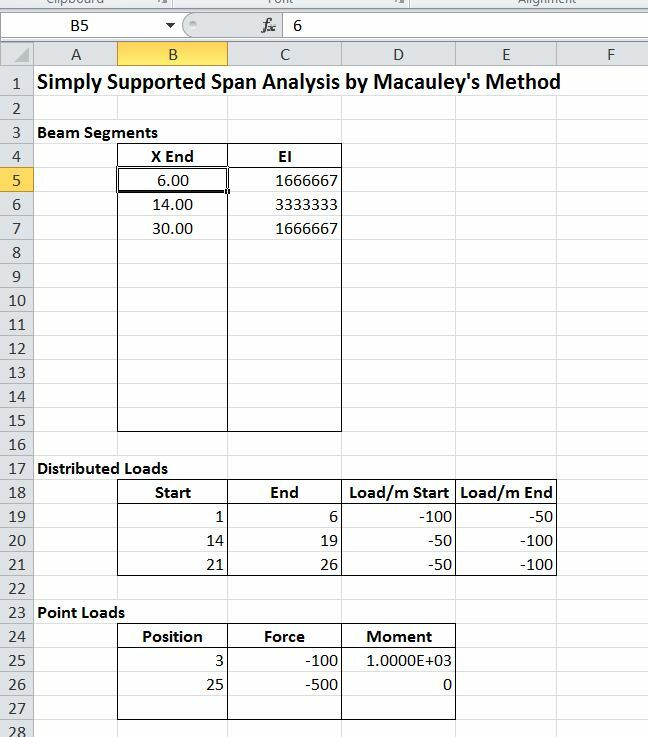 This entry was posted in Beam Bending, Excel, Frame Analysis, Newton, Numerical integration, UDFs, VBA and tagged Excel, Macaulay's Method, simply supported beam, UDF, VBA. Bookmark the permalink. Very good tutorial for me! Thanks a lot! Thank you for posting such a useful tool. 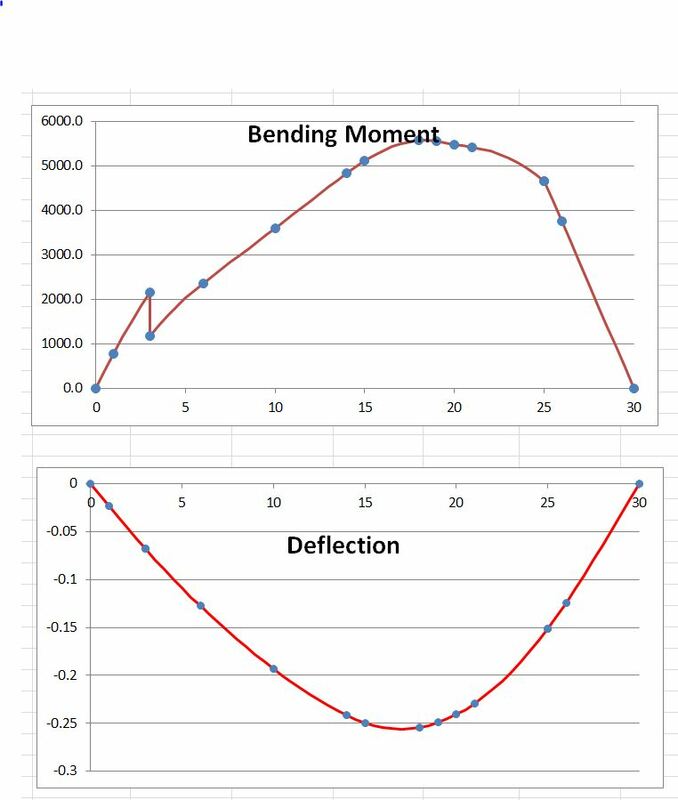 I was wondering how to get excel to add multiple loads on a SS-beam (analysis of a blast resistant door frame) at varying locations and realised the Macaulays method was probably the best way of evaluating the BM from which I could undertake a SDOF analysis of the door as a whole. Your spreadsheet will be invaluable. Glad you found it useful Steve. Feel free to ask if anything isn’t clear, or suggest improvements and/or extensions. Thank you, I am trying to edit the SSSpan worksheet as this best suits the side frame of a blast resistant door. Can I call you to discuss a few questions? Steve – I’m off to bed now (Sydney time is 10 hours ahead of GMT (+9 UK summer time), but if you send me an e-mail to dougaj4 at gmail I’ll send contact details. setu – I can’t help with matlab. If you have any specific questions with the spreadsheet feel free to post them here. Just wanted to mention: Dr Colin Caprani’s site has desappeared. What do you know about this? Luis – I had a message from Colin that his site was down because of a problem with his service provider. That was some time ago so he probably has other priorities. I Have a proble with to roller supports in distances of 0.5 and 2.5(from left hand side) meters respectively.And a few pointloads. Can I still use your spreadsheed, because I see its only or a cantilever beam? Please send an example to dougaj4 at gmail and I will have a look. I don’t understand your second question. The continuous beam functions in the spreadsheet will work for any number of spans, with or without cantilevers at the ends.